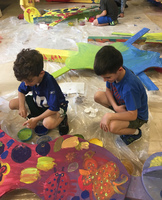 NEW CANAAN, CT - Silvermine Arts Center’s Art Partners Outreach Education Program is the recipient of a $50,000 grant from the William Randolph Hearst Foundation. Art Partners, headed by Outreach Education Director Sophia Gevas, serves nearly 1,000 students in Stamford and Norwalk each year. Professional Teaching Artists collaborate with classroom teachers and after-school program directors to offer curriculum-based studio art projects that enhance critical-thinking skills and foster the joy of learning. Since 1992, Art Partners’ professional Teaching Artists have collaborated with classroom teachers and program directors to provide programs for approximately 15,000 under-resourced students. Silvermine’s outreach partnerships have included Brookside Elementary, Columbus Magnet School, Rowayton Elementary, Silvermine Elementary, Nathan Hale Middle School, Trailblazers Academy Middle School, West Rocks Middle School, the Norwalk Housing Authority’s After-School Programs, Star, Inc., and many others. Examples of projects include research-inspired murals, Fodor Farm garden sculptures that involved scientific research on plants, and a book of photography and poetry that is now part of the Norwalk Public Library collection. Several of the Art Partners collaborations have culminated in exhibitions of student work in Silvermine’s Student Gallery—complete with receptions for the students and their families. The Hearst Foundations, which include The Hearst Foundation Inc. and the William Randolph Hearst Foundation, are operated separately from the Hearst Corporation. The Foundations have made more than 20,000 grants totaling more than $1 billion. The Foundations give grants to organizations in the areas of education, culture, social service and health. This is the second Hearst grant for Silvermine’s Art Partners program. The first was awarded in 2014.